The Scandic Continental Helsinki is a fashionable hotel in Helsinki that sits just opposite Hesperia Park. The Sibelius Monument and the National Museum of Finland are two popular local attractions that can be found less than a mile from the property. Helsinki Vantaa Airport is just 12 miles from the Scandic Continental Hotel Helsinki, and an airport bus stop is located right behind the hotel. The Scandic Continental Hotel Helsinki's guestrooms feature a variety of in-room amenities such as a work desk, wireless Internet access, air conditioning, hairdryers, safes, movies on demand, dataports, mini-bars, and satellite TV. This 9-story establishment was built in 1975 and is one of Helsinki’s largest buildings. Each morning, guests can wake up to a delicious KRAV-certified buffet breakfast that offers 101 energizing breakfast options, and coffee, snacks, and cocktails enjoyed in the hotel lobby. Before setting out to explore the nearby attractions, guests can talk to the hotel’s multilingual concierge staff to get information on nearby sightseeing locations. 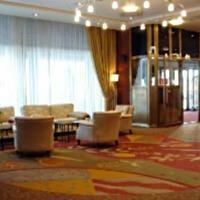 The Scandic Continental Hotel Helsinki also features a large health club, relaxation area, and a heated rooftop pool.